WDW doesn't mean Walt Disney World, it means Walking Dead Wednesday! 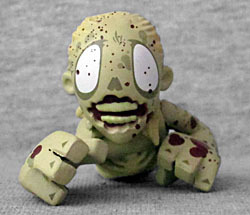 My second Walking Dead Mystery Minis purchase is, sadly, not a zombie that really goes with Merle - and yet, it's one that not only appeared in the comics, but is also one we've already reviewed in the past: the Bicycle Girl! Okay, it may not be the one I was hoping for (that'd be "Teddy Bear Walker"), but bonus points for being iconic. Just as you'd expect, Bicycle Girl is crawling on her belly - well, where her belly would be, if she still had one. Unlike the McFarlane toy, she's appropriately absent from the waist down, with nothing but a trail of intestines dragging behind her. 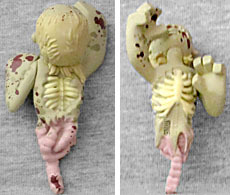 Her ribcage is visible both front and back, and she ends up about 2¾" long. To show how decayed she is, she's mostly bald. The skin around her mouth is torn away, this line's shorthand for "zombie wounds" - they all have it. Her skin is a yellowish gray, while the "wounded" area around her mouth is a dark red. Her guts are pink, and her teeth and ribs are white. The normal release of Bicycle Girl is packed 1:12, and so is her variant. As you can see in these pictures, I managed to get the bloody one; the standard release just has blood on her hands, not her entire body. Though she wouldn't have been my first choice, the Bicycle Girl is a nice representation of a recognizable zombie from the show and was translated to toy form well.